I had the pleasure to meet Matthew Carter, a knife maker in Bend OR. 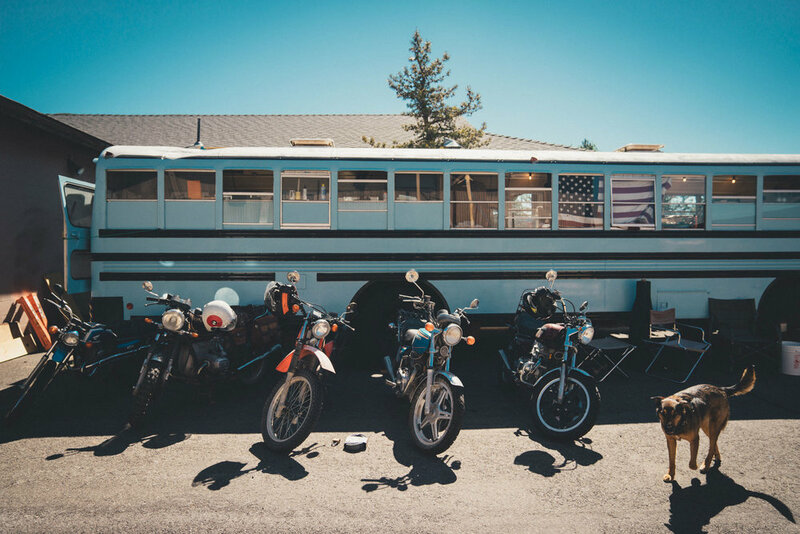 He lives and works from his 1997 Bluebird school bus, which he transformed it himself into a work shop and a home for him and his dog Roo. Matthew masters the craft of custom knife-making and shows me in detail how he works, starting with a plain piece of metal and highly detailed pocket knife. He explains me how he got the bus. There are many old school busses in the US who got a second life. If you buy them directly from a school district, chances are high that they are still in great shape. This is simply because of the fact that the sole purpose of these vehicles has been transporting children, so for safety reasons they got mechanical check-ups on a regular basis. And surprisingly, in most states you don’t need an additional drivings license to get behind the wheel of this 20 m2 (210 sq ft) vehicle. In order to lawfully drive this bus on public roads as a private owner, you need to take out all the seats and keep it under a certain weight limit. Once stripped, It’s pretty amazing how much space you have in these school busses. It makes you dream about the possibilities of having such a large vehicle to live and travel in. I’ve met people who live permanently on the road in RV’s, working in different places, living a nomadic lifestyle. The wide pavement of US roads allows to move around easily with large vehicles. As for now, I’m happy with the simple setup of the bike. Check out Matthews instagram @catverknifeco and find out more about his knifes and the transformation of his bus. If you need a good bush-craft knife for camping, a large hunting knife, or just something cool to spread your peanut butter sandwich with, he can take care of your wishes.